Keeping your dog’s ears clean and healthy can prevent common problems including ear infections, bad odor, and wax buildup. That’s why regular ear cleaning should be an essential part of your dog’s grooming routine. There are many products on the market that are designed to clean your dog’s ears. But with so many options to choose from, it can be difficult to know which ear cleaner will deliver the best results. We reviewed dozens of dog ear cleaners to identify the best of the best, based on factors including quality of ingredients, formula, affordability, and Amazon reviews. We then narrowed our search down to 5 of the best dog ear cleaners available today. A market-leading dog ear cleaner that’s specially formulated to manage problematic ears. One dog ear cleaner stood out as the clear winner during the course of our research: ZYMOX Pet King Brand Otic Pet Ear Treatment with Hydrocortisone. Key features of this popular ear cleaner include a patented formula with enzymatic action, and easy, one-step application. ZYMOX Pet King Brand Otic Pet Ear Treatment with Hydrocortisone is our top pick among the dog ear cleaners we looked at. The best-selling ear cleaner has over 8,500 reviews on Amazon, with overwhelmingly positive comments. 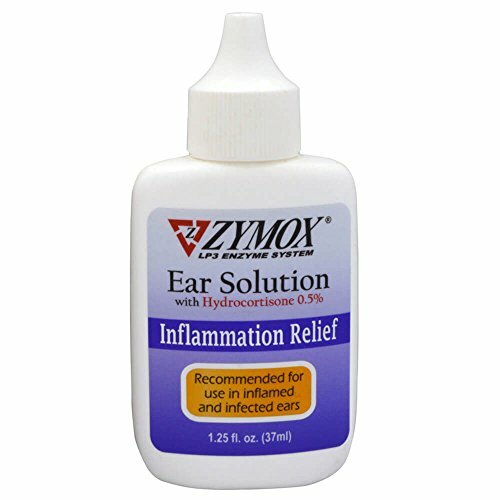 ZYMOX’s patented formula offers a safe, gentle, and natural alternative to traditional therapy. It is also highly effective in the management of acute and chronic otitis due to bacterial, fungal, and yeast infections. The easy-to-use ear cleaner works without antibiotics, and contains powerful natural enzymes to maximize cleaning power. Most reviewers say the product is effective and affordably priced. 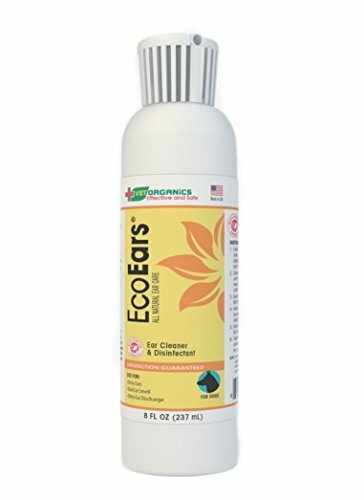 An all-natural dog ear cleaner from EcoEars that’s safe, gentle, and effective. Looking for an all-natural dog ear cleaner that gets the job done? Check out our runner up pick, EcoEars Natural Dog Ear Cleaner. This safe and effective ear cleaner washes away pathogens, grime, and most other common invaders in a dog’s ears. It also helps eliminate wax buildup, inflammation, and redness in the ear canal. The all-natural formula contains no pharmaceuticals, synthetic chemicals, steroids, solvents, or antibiotics. This means that it’s safe for use on dogs with sensitive skin. This easy-to-use dog ear cleaner from ZYMOX contains natural enzymes for maximum cleaning power. ZYMOX Ear Solution with 0.5-Percent Hydrocortisone is an affordably-priced dog ear cleaner that instantly starts working to clean a pet’s ears and rid them of wax buildup and debris. The ear cleaner contains ZYMOX’s patented enzyme formula for fast and effective cleaning. It is also recommended for use in inflamed and infected ears. This product is popular with pet parents and features a high number of positive reviews on Amazon. Reviewers say the ear cleaner fights infection and cleans deeply. A mild, alcohol-free liquid dog ear cleaner that cleanses and dries the ear canal. Virbac Epi-Otic Advanced Ear Cleaner is a mild and gentle liquid dog ear cleaner with a low pH. It has a non-irritating, antiseptic formula, and is suitable for routine ear cleansing. The ear cleaner also features a patented anti-odor technology and anti-adhesive properties to prevent microbial attachment. It contains no alcohol or chlorhexidine, and may be used in dogs and cats of any age. These dog ear wipes from Pet MD gently cleanse and stop itching. Pet MD Dog Ear Cleaner Wipes are designed to clean, deodorize, and dry your pet’s ears. They are convenient, easy to use, and keep ears free of wax, discharge, and debris. The advanced veterinary formula also prevents infection and inhibits yeast and mites. These convenient, disposable dog ear wipes contain aloe and eucalyptus to reduce itching and soothe your dog’s ears. Reviewers say they smell fresh and help prevent ear infections and foul odor. Ear cleaning is a vital part of your dog’s regular grooming routine, and helps prevent painful ear infections. Dog ear cleaners can also help minimize issues including wax buildup, itchiness, and inflammation in the ears. Thankfully, there are a wide range of ear cleaners on the market that are designed to keep your pet’s ears clean and free from infection. When choosing an ear cleaner, consider your dog’s needs and select a high-quality product from a reputable manufacturer. It’s also important to keep your pet’s hair trimmed around their ears to prevent dirt and debris becoming trapped in the ear canal. If you’re looking for an easy way to trim your dog’s hair at home, check our article on the best dog grooming clippers. Ingredients. A good dog ear cleaner should be made with high-quality ingredients that cleanse your pet’s ears without causing irritation. Always check the ingredients list on a dog ear cleaner, and avoid products that contain too many harsh chemicals. We recommend speaking with your veterinarian if you need more information about choosing a high-quality dog ear cleaner. Formula. Dog ear cleaners are available in a wide range of formulas. Some are multi-purpose cleaners designed to clean, deodorize, and dry your dog’s ears, while others are designed to address a specific problem such as yeast infections in the ear. Always do your research and select an ear cleaner that’s suitable for your dog’s needs. Ear wipes vs. liquid ear cleaners. Dog ear cleaners come in two main categories: ear wipes and liquid ear cleaners. Dog ear wipes are a convenient solution for keeping your dog’s ears free from dirt and debris. By comparison, liquid ear cleaners are more suitable for deep cleansing and preventing and addressing problems including ear infections and wax buildup. Easy to use. Your dog’s ears should be cleaned regularly, so it’s important to choose an ear cleaner that’s easy to use. Always read the instructions on the packaging of the ear cleaner, and apply as instructed. This will help prevent accidental damage to your pet’s ears. What is a dog ear cleaner and how does it work? A dog ear cleaner is a product that’s designed to cleanse your pet’s ears and prevent or address common problems including ear infections and wax buildup. Dog ear cleaners come in the form of pre-moistened wipes or liquid ear cleaners that can be applied topically to your dog’s ears. They are formulated with cleansing agents and antimicrobial ingredients that help keep ears clean and healthy. How do you use a dog ear cleaner? Dog ear wipes are used to clean the outside of your pet’s ears, while liquid dog ear cleaners are applied topically in the ear canal. Always read the label on a dog ear cleaner, and apply the product as instructed. How often you clean your dog’s ears should depend on several factors including their age, breed, level of activity, and overall health. As a general rule of thumb, most dogs should have their ears cleaned at least once or twice a month. Your veterinarian can help you decide how often to clean your dog’s ears. Why do my dog’s ears stink? Ear odor in dogs can be caused by a number of underlying issues. These include wax buildup, ear infections, and moisture in the ears. Please seek medical care if ear odor is an ongoing problem for your dog. We looked at 20 other dog ear cleaners. Even though they didn’t make our 5 best dog ear cleaners, they’re the best of the rest and each is still is great option for your pooch. The information you’ll need to compare each one is included with the listing. These luxuriously soft cotton dog ear wipes from Petpost are free from harsh chemicals and pesticides which can irritate your pet’s ears. These gentle dog ear wipes with aloe and eucalyptus effectively soothe and cleanse ears without causing irritation. Dog ear wipes with an advanced veterinary formula that’s designed to gently clean, deodorize, and dry your pet’s ears. 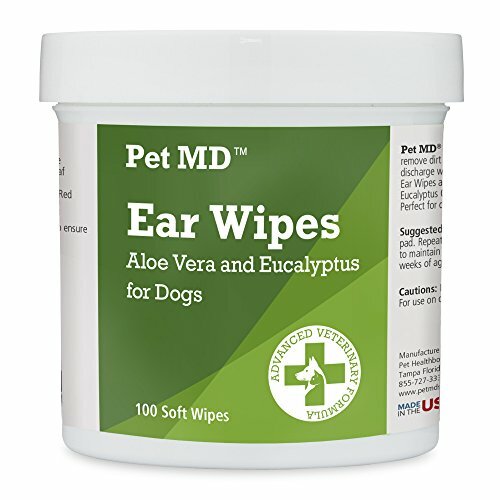 Veterinarian formulated dog ear wipes with soothing aloe and eucalyptus for gentle and non-irritating ear cleansing. A soothing, safe, gentle, and powerful ear cleansing solution for use on dogs and cats. Reviewers say this ear cleaner is effective at preventing ear infections. This soothing, all-natural ear cleaner from Bodhi Dog is designed to treat and prevent ear mites, inflammation, and ear odor. A veterinarian formulated dog ear cleaner that’s specially designed to fight stubborn ear infections caused by yeast, fungus, and bacteria. These pet ears drops from Doggie Dailies are formulated using an effective blend of aloe vera, tea tree oil, witch hazel, and echinacea that work together to safely loosen and remove dirt, ear wax, and debris from your pet’s ears. A patented, pH-balanced dog ear cleaner for frequent and general ear cleansing. This product has a fresh apple scent, and is safe for use on pets. Dr. Gold’s Ear Therapy is medically formulated to treat bacterial, fungal, and yeast infections in dogs and cats. The anti-bacterial and anti-fungal properties reduce foul odors, redness, and swelling, while also providing daily care maintenance for a healthy pet. A safe and gentle liquid dog ear cleaner that’s specially formulated to clean, dry, and deodorize the ear canal. Reviewers say this product eliminates odor and keeps ears healthy. This effective ear cleaner for dogs provides almost immediate relief from infections, inflammation, swelling, redness, and irritation in the ears. This veterinarian formulated liquid dog ear cleaner from Pet MD is scientifically designed to deodorize, clean, dry, and acidify ears. An all-natural dog ear cleaner that helps relieve the root cause of ear problems including mites, flea bites, inflammation, yeast infections, and irritation. An effective and fast-working dog ear cleaner that acidifies, deodorizes, cleans, and dries the ear canal to prevent bacterial and fungal growth. This safe and effective dog ear cleaner flushes the ears and protects against fungal and bacterial growth in the ear canal. An affordable and effective ear cleaner that helps prevent and treat the most common ear problems in cats and dogs. Most reviewers say this ear cleaner is gentle enough for routine use. Vet’s Best Ear Relief Wash Cleaner for Dogs cleans and soothes raw, itchy, smelly, or greasy dog ears. It is formulated with a combination of natural ingredients, including witch hazel, chamomile, aloe vera, clove oil, and tea tree oil to help control unpleasant odor and itching. A safe and gentle dog ear cleaner with aloe vera that’s formulated for daily use. This product will not sting, burn, or aggravate the ear canal. This best-selling ear cleaner from ZYMOX instantly starts working to clean a pet’s ears and rid them of wax buildup and debris.